The Waverly Fire Department is comprised of a group of dedicated volunteers from the community. 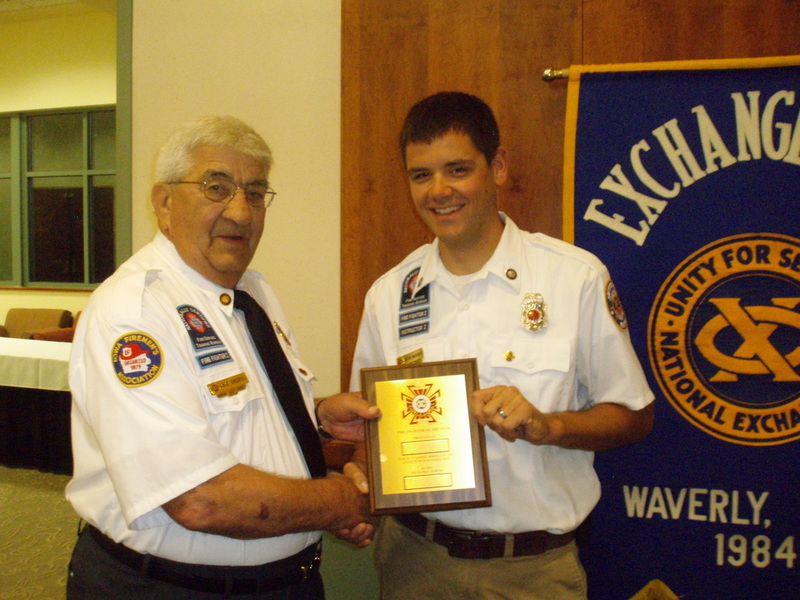 Knowing the importance and value of volunteerism and service, each year the Waverly Exchange Club recognizes the Firefighter of the Year. 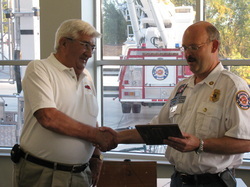 In conjunction with National Fire Safety Week in October, the recipient receives an engraved plaque, and all members of the Waverly Fire Department are invited to attend the award presentation. 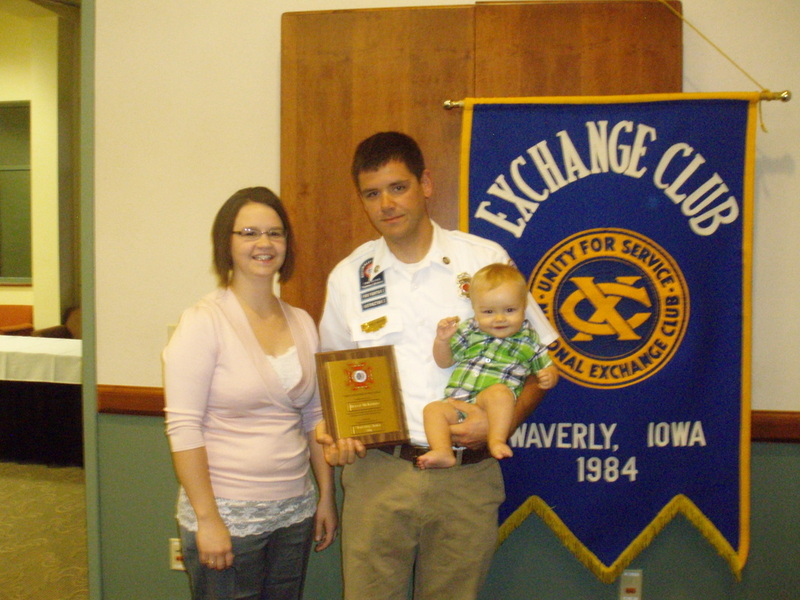 The Waverly Exchange Club recently recognized Cody Schutte as its 2014 Firefighter of the Year. Schutte is a third generation fire fighter. He joined the Waverly Fire Department in 2011 and quickly established himself as one of the group’s future leaders. He is a frequent volunteer for non-fire activities, as well as responding to approximately 60% of all calls since he joined the department. He consistently ranks in the top two or three department volunteers for annual training hours, averaging about 100 hours a year. Cody is a member of the Technical Rescue Squad and completed his national Firefighter I certification in 2012. 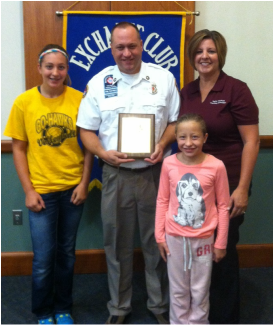 The Waverly Exchange Club recently recognized John Rediske as its 2013 Firefighter of the Year. 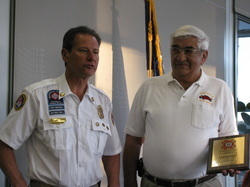 Rediske is a 32-year veteran of the Waverly Fire Department. Since 1996, he has responded to 882 calls and logged over 520 hours of training. He has been very active in all phases of the department – responding to calls, participating in training, maintaining equipment and helping with countless fundraisers and community events. Rediske is currently certified as a Firefighter II, Driver Operator/Pumper, HAZ-MAT Operations and was an active member of the water rescue/dive team. He has held many officer level positions over the years and was an Assistant Chief from 1998 to 2003.
firefighter he quickly became very involved in the departments activities. In his first six months on the department he assisted in the 2008 flood response efforts and responded to a fatal vehicle accident and house fire among many other responses. In addition to his response activities, he has also completed national certification as a Firefighter I, a 120-hour basic training class, and Firefighter II, a 60-hour advanced training class. 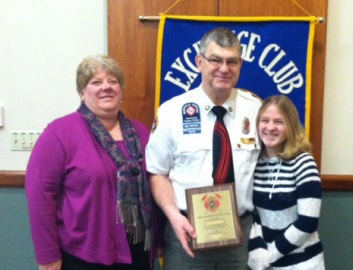 Jeff's commitment to fire safety is highlighted by his efforts in managing local fire prevention activities. For the past three years he has developed and delivered a highly educational fire prevention program in K-4th grades in Waverly. 3rd generation firefighter. Bryce’s certifications are Firefighter I & II, Fire Service Instructor, EMT and Hazard Materials Operations. Bryce serves on the training committee, truck committee and has co-chaired the chicken barbeque fundraiser three times. He attends all training available to improve his skills. Congratulations Bryce and thank you for your service to the community! 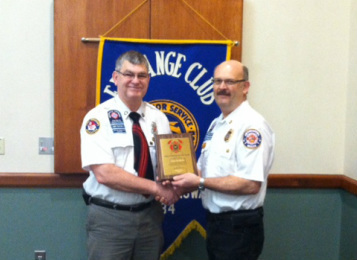 Waverly Exchange Club Firefighter of the Year, Mike Siberski, receives congratulations from Dan McKenzie. Jim McKenzie shares all the accomplishments Mike Siberski provides to the Waverly Volunteer Fire Department.